Dodgy or dumb? When Republican candidates won’t talk about the issues, it’s tough to tell the difference. What is it with Republican candidates refusing to talk about their positions on the issues? Maybe they’re afraid voters won’t like what they have to say. Or maybe they don’t know the answers. In the case of David Trott, who is running for the seat in Michigan’s 11th Congressional District held by Kerry Bentivolio, it could be both. Trott has studiously avoided answering questions about the Republican budget crafted by fellow Scroogian Rep. Paul Ryan. The super-wealthy foreclosure vulture is pandering to high-dollar donors and big business interests, so alienating middle class voters doesn’t seem to be an issue to him. Maybe Trott doesn’t care, or maybe he just doesn’t understand how the budget would sell out the middle class in favor of special interests — something Michiganders are all too familiar with. So the Democratic Congressional Campaign Committee (DCCC) decided to help him out. 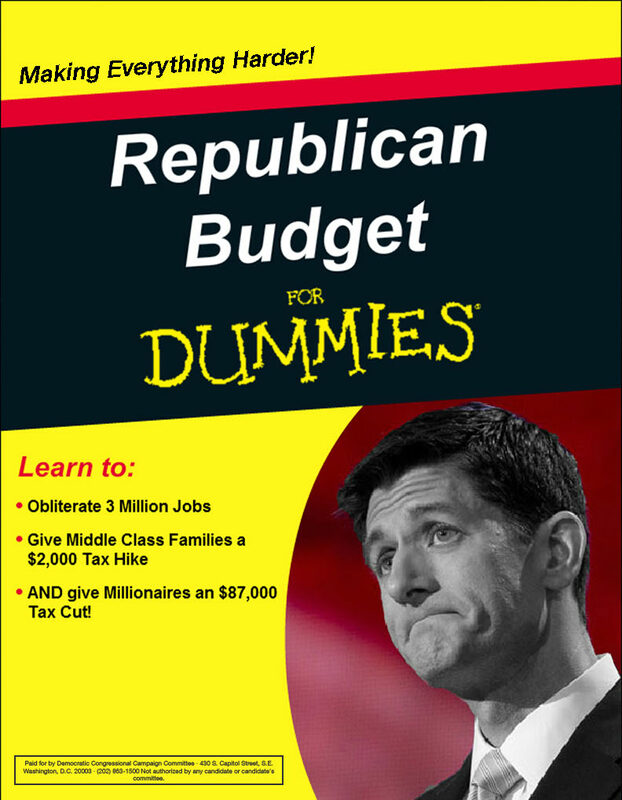 After the DCCC sent candidates a copy of the 102-page Republican budget last week, the Committee followed up with the Republican Budget for Dummies. David Trott is out of excuses. In case the 102-page Republican budget we sent him was too long, we are providing a handy cheat sheet containing all of the middle class-squeezing, special interest-coddling lowlights in David Trott’s Washington friends’ Republican budget. David Trott cannot hide from the people of Michigan any longer, since this one simple guide shows how the Republican budget obliterates 3 million jobs and hikes middle class families’ taxes by $2,000, all while handing millionaires and special interests tax breaks. With this guidebook in hand, Trott can now come clean as to how he would vote on these backward priorities. Because you’re reading this, you’re no dummy. But check out the 2-page Republican Budget for Dummies primer to learn more. There will be a lot of questions dodged by Republicans heading into the 2014 elections. Candidates like David Trott think voters won’t bother to separate fact from subterfuge, but you’re smarter than that.